2012: Landsat Science Team Award, USGS. 2008: Faculty Career Development Award, UCLA. 2006: New Investigator Award, National Aeronautics and Space Administration (NASA). 2006: Top 100 Science Story of 2005, Discover Magazine. 2001: Service Excellence Award, CPGIS. 1997: William A. Fischer Remote Sensing Award, ASPRS. Shen, D. and Y. Sheng, 2012. Area partitioning for channel network extraction using digital elevation models and remote sensing, IEEE Geoscience and Remote Sensing Letters, 9 (2): 194-198. Wang, J., Y. Sheng, K.M. Hinkel, and E.A. Lyons, 2012. Drained thaw lake basin recovery on the western Arctic Coastal Plain of Alaska using high-resolution digital elevation models and remote sensing imagery, Remote Sensing of Environment, 119: 325-336. Zhao, H., G. Li, Y. Sheng, M. Jin, and F. Chen. 2012. Early–middle Holocene lake-desert evolution in northern Ulan Buh Desert, China, Palaeogeography, Palaeoclimatology, Palaeoecology, 331–332 (2012) 31–38. Hinkel, K.M., Y. Sheng, J.D. Lenters, E.A. Lyons, R.A. Beck, W.R. Eisner, and J. Wang. 2012. Thermokarst lakes on the Arctic coastal plain of Alaska: geomorphic controls on bathymetry, Permafrost and Periglacial Processes, 23 (2012): 218–230. Hinkel, K.M., Z. Lin, Y. Sheng, and E.A. Lyons, 2012. Spatial patterns of lake ice meltout near Barrow, Alaska, Polar Geography, 2012: 1-18. Hinkel, K.M., J.D. Lenters, Y. Sheng, E.A. Lyons, R.A. Beck, W.R. Eisner, E.F. Maurer, J. Wang, and B. L. Potter. 2012. Thermokarst lakes on the Arctic coastal plain of Alaska: spatial and temporal variability in summer water temperature, Permafrost and Periglacial Processes, 23 (2012): 207–217. Fricker, G.A., S.S. Saatchi, V. Meyer, T.W. Gillespie, and Y. Sheng. 2012. Application of semi-automated filter to improve waveform lidar sub-canopy elevation model, Remote Sensing, 4: 1494-1518. Niu, Z.,H. Zhang, X. Wang, W. Yao, D. Zhou, K. Zhao, H. Zhao, N. Li, H. Huang, C. Li, J. Yang, C. Liu, S. Liu, L. Wang, Z. Li, Z. Yang, F. Qiao, Y. Zheng, Y. Chen, Y. Sheng, X. Gao, W. Zhu, W. Wang, H. Wang, Y. Weng, D. Zhuang, J. Liu, Z. Luo, X. Cheng, Z. Guo, And P. Gong. 2012. Mapping wetland changes in China between 1978 and 2008, Chinese Science Bulletin, 57 (22): 2813-2823. Qiao, C., J. Luo, Y. Sheng, Z. Shen, Z. Zhu, and D. Ming. 2012. An adaptive water extraction method from remote sensing image based on NDWI, Journal of Indian Society for Remote Sensing, 40 (3):421–433. Smith, L.C., D.W. Beilman, K.V. Kremenetski, Y. Sheng, G.M. MacDonald, R.B. Lammers, A.I. Shiklomanov, and E.D. Lapshina. 2012. Influence of permafrost on water storage in West Siberian peatlands revealed from a new database of soil properties, Permafrost and Periglacial Processes, 23 (2012): 69-79. Lei, Y., T. Yao, Y. Sheng, E. Zhang, W. Wang and J. Li, 2012. Characteristics of δ13CDIC in lakes on the Tibetan Plateau and its implications for the carbon cycle, Hydrological Processes, 26: 535-543. Sheng, Y. 2011. Remote Sensing. The SAGE Handbook of Geographical Knowledge (J.A. Agnew and D.N. Livingstone, editors), SAGE Publications Ltd, Los Angeles, pp.171-184. Yuan, F., Y. Sheng, T. Yao, C. Fan, J. Li, H. Zhao, and Y. Lei, 2011. Evaporative enrichment of oxygen-18 and deuterium in lake waters on the Tibetan Plateau, Journal of Paleolimnology, 46: 291-307. Li, J. and Y. Sheng, 2012. An automated scheme for glacial lake dynamics mapping using Landsat imagery and digital elevation models: a case study in the Himalayas, International Journal of Remote Sensing, 33 (16): 5194-5213. Lei, Y., T. Yao, C. Yi, W. Wang, Y. Sheng, J. Li, And D.L Joswiak. 2012. Glacier mass loss induced the rapid growth of Linggo Co on the central Tibetan Plateau, Journal of Glaciology, 58 (207): 177-184. Sheng, Y. and J. Li, 2011. Satellite-observed endorheic lake dynamics across the Tibetan Plateau between circa 1976 and 2000. Remote Sensing of Protected Lands (Y. Wang, editor), CRC Press, New York, pp.305-319. M.I. Venkatesan, O. Merino, J. Baek, T. Northrup, Y. Sheng, J. Shisko, 2010. Trace organic contaminants and their sources in surface sediments of Santa Monica Bay, California, USA. Marine Environmental Research: 69 (5): 350–362. Lee, H., M. Durand, H.C. Jungab, D. Alsdorf, C.K. Shum, and Y. Sheng, 2010. Characterization of surface water storage changes in Arctic lakes using simulated SWOT measurements, International Journal of Remote Sensing: 31 (14): 3931–3953. Sheng, Y., and T. Yao, 2009. Integrated assessments of environmental change on the Tibetan Plateau, Environmental Research Letters, doi: 10.1088/1748-9326/4/4/045201. Sheng, Y., 2009. PaleoLakeR: a semi-automated tool for regional-scale paleo lake recovery using geospatial information technologies, IEEE Geoscience and Remote Sensing Letters, 6 (4): 797-801. Luo, J., Y. Sheng, Z. Shen, J. Li, and L. Gao, 2009. Automatic and high-precise extraction for water information from multispectral images with the step-by-step iterative transformation mechanism. Journal of Remote Sensing, 13 (4): 604-609. Shah, C.A., Y. Sheng, and L.C. Smith. 2008. Automated Image Registration Based on Pseudo Invariant Metrics of Dynamic Land-Surface Features. IEEE Transactions on Geoscience and Remote Sensing, accepted. Sheng, Y. 2008. Three-dimensional GIS data acquisition. Manual of GIS (M. Madden, editor), ASPRS, forthcoming. Sheng, Y. 2008. Modeling Algorithm-Induced Errors in Iterative Mono-Plotting Process. Photogrammetric Engineering & Remote Sensing, forthcoming. Sheng, Y. 2008. Quantifying the Size of Lidar Footprint: A Set of Generalized Equations. IEEE Geoscience and Remote Sensing Letters, 5 (3): 419-422. Sheng, Y., C.A. Shah, and L.C. Smith, 2008. Automated Image Registration for Hydrologic Change Detection in the Lake-Rich Arctic. IEEE Geoscience and Remote Sensing Letters, 5 (3): 414-418. Sheng, Y. 2007. Minimising Algorithm-Induced Artefacts in True Ortho-Image Generation: A Direct Method Implemented in the Vector Domain. Photogrammetric Record, 22 (118): 151-163. Smith, L.C., Y. Sheng, and G.M. MacDonald, 2007. A First Pan-Arctic Assessment of the Influence of Glaciation, Permafrost and Peatlands on Northern Lake Distribution. Permafrost and Periglacial Processes, 18 (2): 201-208. MacDonald, G.M., D.W. Beilman, K.V. Kremenetski, Y. Sheng, L.C. Smith, A.A. Velichko, 2006. Rapid Early Development of Circumarctic Peatlands and Atmospheric CH4 and CO2 Variations. Science, 314 (5797): 285-288. Smith, L.C., Y. Sheng, F.J. Magilligan, N.D. Smith, B. Gomez, L.A.K. Mertes, W.B. Krabill and J.B. Garvin. 2006. Geomorphic Impact and Rapid Subsequent Recovery from the 1996 Skeiðarársandur Jökulhlaup, Iceland, Measured with Multi-year Airborne Lidar. Geomorphology, 75 (1-2): 65 - 75. Sheng, Y. 2005. Theoretical Analysis of the Iterative Photogrammetric Method to Determining Ground Coordinates from Photo Coordinates and a DEM. Photogrammetric Engineering & Remote Sensing, 71 (7): 863 - 871. Sheng, Y. and D. Alsdorf. 2005. Automated Ortho-Rectification of Amazon Basin-Wide SAR Mosaics Using SRTM DEM Data. IEEE Transactions on Geoscience and Remote Sensing, 43 (8): 1929-1940. Smith, L.C, Y. Sheng, G.M. MacDonald, and L.D. Hinzman. 2005. Disappearing Arctic Lakes. Science, 308 (5727): 1429. Sheng, Y., L.C. Smith, G. MacDonald, K.V. Kremenetski, K.E. Frey, A.A. Velichko, M. Lee, D.W. Beilman, and P. Dubinin. 2004. A High-Resolution GIS-Based Inventory of the West Siberian Peat Carbon Pool. Global Biogeochemical Cycles, 18 (30): GB3004: 1-14 (doi:10.1029/2003GB002190). Sheng, Y. 2004. Comparative Evaluation of Iterative and Non-Iterative Methods to Ground Coordinate Determination from Single Aerial Images. Computers & Geosciences, 30 (3): 267-279. Smith, L.C., G.M. MacDonald, A.A. Velichko, D.W. Beilman, O.K. Borisova, K.E. Frey, K.V. Kremenetski, and Y. Sheng. 2004. Siberian Peatlands a Net Carbon Sink and Global Methane Source since the Early Holocene. Science, 303 (5656): 353-356. Smith, L.C., Y. Sheng, R.R. Forster, K. Steffen, K.E. Frey, and D.E. Alsdorf. 2003. Melting of Small Arctic Ice Caps Observed from ERS Scatterometer Time Series. Geophysical Research Letters, 30 (20): 2034: 1-4 (doi: 10.1029/2003GL017641). Sheng, Y., P. Gong, and G.S. Biging. 2003. True Orthoimage Production for Forested Areas from Large-Scale Aerial Photographs. Photogrammetric Engineering & Remote Sensing, 69 (3): 259-266. Sheng, Y., P. Gong and G.S. Biging. 2003. Model-based Conifer Canopy Surface Reconstruction from Photographic Imagery: Overcoming the Occlusion, Foreshortening and Edge Effects. Photogrammetric Engineering & Remote Sensing, 69 (3): 249-258. Gong, P., Y. Sheng and G.S. Biging. 2002. 3D Model-Based Tree Measurement from High-Resolution Aerial Imagery. Photogrammetric Engineering & Remote Sensing, 68 (11): 1203-1212. Sheng, Y., L.C. Smith, K.E. Frey, and D.E. Alsdorf. 2002. A High Temporal-Resolution Dataset of ERS Scatterometer Radar Backscatter for Research in Arctic and Sub-Arctic Regions. Polar Record, 38 (205): 121-126. Sheng, Y., P. Gong and G.S. Biging. 2001. Model-Based Conifer-Crown Surface Reconstruction from High-Resolution Aerial Images. Photogrammetric Engineering & Remote Sensing, 67 (8): 957-965. Sheng, Y., P. Gong, and Q. Xiao. 2001. Quantitative Dynamic Flood Monitoring with NOAA/AVHRR. International Journal of Remote Sensing, 22 (9): 1709-1724. Su, Y., and Y. Sheng. 1999. Visualizing Upwelling at Monterey Bay in an Integrated Environment of GIS and Scientific Visualization. Marine Geodesy: An International Journal of Ocean Surveys, Mapping, and Sensing, 22 (2): 93-104. Gong, P., G. S. Biging, S. M. Lee, X. Mei, Y. Sheng, R. Pu, B. Xu, K. P. Schwarz, and M. Mostafa. 1999. Photo Ecometrics for Forest Inventory. Geographic Information Sciences, 5 (1): 9-14. Sheng, Y., Y. Su, and Q. Xiao. 1998. Challenging the Cloud-Contamination Problem in Flood Monitoring with NOAA/AVHRR Imagery. Photogrammetric Engineering & Remote Sensing, 64 (3): 191-198. Dr. Yongwei Sheng is a scientist in the field of Geospatial Information Systems and Technologies (GIST) with research interests in remote sensing, photogrammetry, geographic information systems (GIS), and their applications in large-area environmental monitoring and assessment. Remote sensing and photogrammetry are valuable data collection and monitoring tools, especially in regional- and global-scale studies when field data collection is difficult and/or expensive, while GIS is a powerful tool for spatial data analysis and integration of various dimensions of our world. His career goal is to contribute to the development of scientific, theoretical and methodological aspects of GIST. His research interests include geographic information acquisition, uncertainty in geographic information, 3-D information technologies for GIScience. He has been leading and involved in many research projects using GIST as a tool to address natural resources and environmental issues. 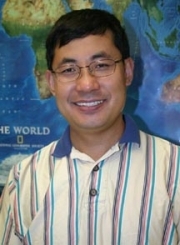 His current research objectives include monitoring lake dynamics in the context of global change, especially in the regions sensitive to climate change such as the Tibetan Plateau and the pan-Arctic, through several ongoing NSF, NASA, and USGS funded projects.